David L. Ulin is a critic, essayist, editor, and novelist. He is a 2015 Guggenheim Fellow and recipient of the California Book Award and has been shortlisted for the PEN/Diamonstein-Spielvogel Award for the Art of the Essay. His writing has appeared in the LA Times (where he spent ten years as book editor and book critic), the Atlantic Monthly, the Nation, the New York Times, the Paris Review, Virginia Quarterly Review, AGNI, Zyzzyva, Columbia Journalism Review, and on NPR's All Things Considered. He is assistant professor of English at the University of Southern California. For anyone who has forgotten the joy and rewards of reading. This former L.A. Times book critic has expanded an earlier version of this short treatise, which is packed with ideas about what we experience when we read. Ulin rages on about the importance of critical thinking and its connection with citizenship and resistance during this current period of political divisiveness and uncertainty. 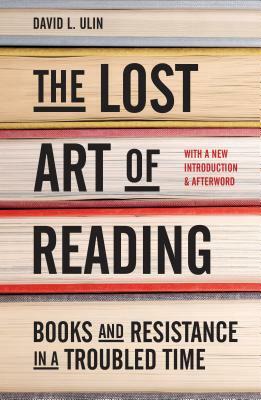 Complete with a brand new introduction and afterword, this book will whet your appetite to begin reading again.